Hi, Karen! It’s so good to be back at your Killer Book Bench! I live in the Pacific Northwest with my husband, three kids (two in high school, one in middle school) and a menagerie of animals (fish, cats, dogs.) I’m excited to tell you that since I was here in October with A Montana Born Christmas, I’m now a USA Today best selling author. The boxed set hit at #78! I write sweet contemporary romance. Those are the stories I’ve always loved to read so writing them seemed like a perfect fit. And it has been. The emphasis is on the romance and emotion. My stories never go pass the kissing and sexual tension. That suits me just fine! I’ve been asked this question before, and my answer hasn’t changed. If I had one superpower, I’d want to be invisible. I think invisibility is the perfect superpower for a writer and a mom! If I’m stuck writing, that usually means I’ve made a mistake or what I call taken a wrong turn. So I go back to the beginning and try to figure out what I did. Once I find it, and fix it, I’m good to write again. This has happened enough time, I finally realized this is just how my brain works! Staring at the blank page. Coming up with the initial words can be difficult. I much prefer rewriting or revising pages I’ve already written. I’d make my mom’s lasagna recipe, some kind of veggie dish depending what was in season, tossed green salad, and garlic bread. Conflict is the hardest for me. I like for my characters to be smiling and happy. But that makes for boring reading. 8. How likely are the people you meet going to end up in your next book? Not likely at all. I might get an idea or mannerism or even inspiration from their looks, but I much prefer to craft my characters from my imagination. 9. Tell us about your hero. Give us one of his strengths and one of his weaknesses. I love Josiah Whittaker. He was first mentioned in my novella Kiss Me, Cowboy. I knew I had to write him as a hero and A Christmas Homecoming was that story. I had him figured out before the heroine! One of Josiah’s strength is his kindness. He’s a billionaire, so has a lot of money to give, but he cares about others feelings. His weakness is a big one—work. He’s a workaholic to the nth-degree. Josiah sees the company he founded and himself as one in the same. Please provide links to your website, blog, books, etc. The only firm release date I have for 2016 is May 31st for an anthology from Zondervan called Kiss the Bride: Three Summer Love Stories. It contains three novellas published individually this year from me, Robin Lee Hatcher, and Kathryn Springer. But I’m working on a couple projects right now. I hope have release dates set soon! 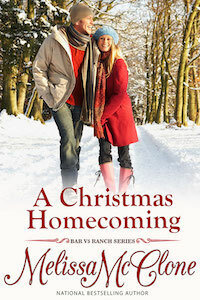 Be sure to come back to read more about Melissa and A CHRISTMAS HOMECOMING, Bar V5 Ranch Series, on Wednesday’s Karen’s Killer Book Bench. Happy Reading! In one scene of my story, a reindeer is mentioned. 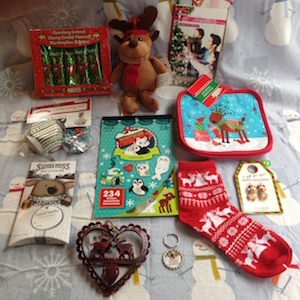 I thought it would be fun to put together a reindeer-themed prize pack. Which one of Santa’s reindeer is your favorite? Thanks, Melissa, for sharing your story with us!! I have a feeling I’ll be seeing his name a few times today, Gretchen! It won’t let me comment anywhere but to a reply. I love Rudolph. Grew up watching Rudoplh the Red Nosed Reindeer. Couldn’t be any one other than Rudolph. I grew up looking forward to watching the Rudolph Christmas special. ? I loved watching that show! I have it on DVD now for my kids. One of my favorites, Glenda. Use to be Ruduolph til the Prancer movie came out. I have not seen the entire Prancer, Melissa. Only bits and pieces! I should add that to my To Do list for this Christmas. Good morning, Melissa, and welcome back to Karen’s Killer Book Bench. As you know, I’ve loved your stories for a long time so I love when you can stop by for a visit. I know I can’t enter the contest but I have to say I do have another favorite reindeer besides Rudolph. Of course, I grew up with that red nosed reindeer. But I also fell in love with the over-eager, mishap-prone, and candy-loving reindeer, Chet, in Santa Claus Two. Thanks for the warm welcome, Karen! I love being back. I always liked Clarice, Rudolph’s girlfriend. She always stood beside him and saw the good in him. I really want to read this book. I love Clarice, Brenda! She was my fave from that show!!!! Rudolph 🙂 This will probably be a very common answer lol. Prancer:) thanks for this awesome chance! I like Blitzen – he is always at the end of the listing of all of the Reindeer. I love that name, Anna! I must admit I’m partial to Vixen after years of watching The Year without a Santa Claus. What a little cutie! No1 fav, love em all. My entire family loves Rudolph! Love Rudolph he’s a classic. Rudolph, since he saves the night. 🙂 Love the prize pack, really cute. Rudolph, I always liked how he overcame being bullied. I’m going to be the rebel and go with Vixen! Red lipstick is my signature and Vixen sounds like a great lipstick name. My reasoning is that any reindeer named Vixen has to be a bit sassy (like me)! I love her, Kathy. I commented above that once I saw a Year without a Santa Claus she became my favorite. So cute! It has to be Rudolph. Growing up, I always looked forward to his show at Christmas! My favorite is Clarice! I love and still watch all the classics I grew up on 🙂 thanks!! Rudolph has always been my favorite reindeer. Thank you for the generous giveaway! Rudolph of course, just love him! Blitzen…I just love the name. My favorite has always been Rudolph, poor little guy, always getting picked on. Hero he is! Comet! I like Rudolph, but he is very popular and Comet is awesome! Dancer! With a name like that nothing but happiness can happen! I’m going to be a bit different here and say Dasher. Why? Because those busy little reindeer have to do some serious dashing to get to all of those houses! Thanks again for another of your generous giveaways. It will have to be Rudolph! I love Rudolph! I would love to fly with him and Santa! My favorite reindeer is Donner. When I was little I used to think that one of the reindeers was named after me because I pronounced it wrong. Donner- Donna I still get teased about it to this day. I love all the reindeer but Dancer is my favorite and Rudolph comes next. What a great giveaway. Good luck everyone. I love Rudolf but Comet (from the Santa Clause movies with Tim Alan.) is my second fave. Rudolph is my favorite!! It isn’t Christmas unless we watch Rudolph the Red-Nosed Reindeer! Rudolph 🙂 Happy Holidays ?? Rudolph! Poor baby with that big shiny nose, but he gets to save the day – night – in the end. Rudolph by far! With his bright red nose.. Please don’t count me for the contest–just wanted to support Melissa! I love all the reindeer but I think I’ll pick Prance because I love his name. Rudolph and Clarice make such a sweet couple. Love Clarice’s long eyelashes and cute bow. I have the Rudolph the Red Nosed Reindeer movie ornaments (some musical) collection that I add to my tree every year. A classic must-see Christmas movie. Thanks Melissa! I don’t know how the r got left off. But I meant Prancer. RUDOLPH is the favorite! Thanks for the chance. My favorite reindeer is Rudolph. This would be wonderful to have. It would be a great gift for my mother. Vixen. Rudolph and Prancer need to step aside and let the others have their time in the limelight and I vote Vixen, lol. Hi Melussa. I love your books. I am commenting to enter your contest. Thank you. Comet… When I see the Santa Clause (Tim Allen)movies Comet makes me laugh. Donder. I had to look it up in my book because I thought it was Donner like the Pass. Rudolph is my favorite reindeer!! Rudolph, I love an underdog! Rudolph used to be my favorite (considering he’s kinda the underdog) but I love the other reindeer for being able to get past their differences and welcome Rudolph as part of the group so I kinda love them all equally! Rudolph is my favorite reindeer because he acts like himself and doesn’t follow the rest of the crew. Thank you for the contest? Rudolph, of course! It always made me sad as a kid that the other reindeer bullied him and Santa didn’t do more. I like so many of them! But for some reason, I’m always low on warm socks. So I’ll pick the socks! They’re quote cute and pretty too! btw, love this interview! Fun questions! Thanks Karen! You’re welcome, AnnieJC! Thanks for stopping in to say hi. Happy Thanksgiving! I always liked dasher, I’m not really sure why, she was just always my favorite! Thank you for this opportunity! My favorite is Vixen-what a name!! Rudolph of course when it comes to the magical reindeer. But I love Prancer to from the movie Prancer. But I love Christmas time. All the movies put me in the spirit. I would say Rudolph for sure. Dasher, he is the first and always forget about. I like the forgotten reindeer blitzen. Rudolf gets so much attention ⚠ and I feel the others should as well. Rudolph always if he’s one running otherwise Prancer ! I would so sure love to win something SO COOL! I really love them all but Rudolf is definitely my favorite one. I believe he’s everybody’s favorite one. Right? Blitzen was the first reindeer that came to mind. I’m not sure I knew that the reindeers had distinguishing features. I only really am aware that Rudolph stands out. Rudolph, thanks for the giveaway! Rudolf! All the other reindeers have nothing that makes them stand out like he does! I think my favorite is probably Donner — maybe because it’s close to my daddy’s name, Don, so I just like the sound of the name when it’s called in the poem. Of course, Rudolph is a favorite of everyone. He’s sort of an underdog, but has become the most famous. I think the other reindeer need more hype 🙂 . Dasher, I just love the name. I can picture him dashing from here to there! I’ll say Rudolph too. That crosses European and American cultures. Just wanted to say to Melissa that I love your favourite superpower. I grew up hearing the expression, ‘I’d love to be a fly on the wall…’ which fit any situation where the person longed to be present, but unseen! I use it all the time with my own children, so I understand exactly what you mean! Rudolph because the others get mixed up to me, they all look the same, must be the rednose…lol and Thank you and Happy Thanksgiving. Clarice and Rudolph are my favorites. Rudolph of course. He was different and they made fun of him, but he showed them up and saved Christmas. I think it’s great especially for kids to see that just because you are different doesn’t mean you can’t make a difference. Rudolph is tops on my list. I like Rudolph the best. Besides Rudolph, I have a fondness for Dancer. Pranced is my favorite. Thanks. I’ve never really thought of which reindeer I like the best. I guess I would have to go with Rudolf. Vixen… The name sounds so fun! Rudolph. I don’t even remember the others. I would have to say Comet! Merry Christmas! I LOVE RUDOLPH BUT FOR SOME REASON MY GRANDDAUGHTER JUST LOVES DASHER….LOL…. THANKS! Rudolph. Ty for great giveaway. I not only love Rudolph but also the story about how he was different and was not accepted, but triumphs in the end, a story which holds true to this day! Prancer is the 1 I would pick. Thanks for the chance to win! They really don’t showcase anyone other than Rudolph, so I’d have to say good Ole Rudy! Rudolph is my favorite. Terrific interview, thank-you for this nice giveaway. How can you chose a favorite? They are all part of a team! They could not pull off Christmas alone, so I cannot pick just one!! Love them all. Rudolph of course. We can’t wait to watch it each year together as a family♡ Such great interview! Thank you for the chance! Nice swag and book thanks for the chance. Dasher because I think he must be fast. Rudolph, of course. I had a stuffed Rudolph as a young child, probably 1950 or so. I’m picking Donner. Don’t want him to feel left out! I can’t imagine anyone but Rudolph lol. I know it’s unoriginal but yes, Rudolph!! My favorite reindeer is dancer. I love the Nutcracker Ballet and my daughter danced it so his name brings happy memories back. Must be Blittzen, always thought it was such a funny name! Dancer. I always wanted to be a dancer when I was little. I like Blitzen. An unusual name that’s not heard much. first one that popped into my head was Blitzen – I just like that name! Cupid and Vixen… I always imagined them as a cute couple. I am going to have to say my favorite reindeer is Prancer, I love the movie and he has always just been one of my favorites. Rudolph is in a close second, and Comet in third. My favorite reindeer is Dasher! I love them all! They all helps Santa and they all adorable no matter what. #boom Ahaha thank you so much for the awesome chance! <3 Happy Thanksgiving! Would have to be Rudolph! I’ve always had a soft spot for Rudolph because of him being an underdog. But I liked the others too. I like Rudolph the best! love the red nose. Rudolph of course!! He’s so vulnerable yet turns out so brave!! And being a underdog growing up he has a huge place in my heart. I like Rudolph’s girlfriend, Clarice! My favorite of Santa’s Reindeer is Rudolph. Donder, just because the name sounds so big and strong. Love all of them of course. I am fairly new to your books and love find a good author who does “sweet” romance. PRANCER is my favorite Christmas movie so my favorite is PRANCER. Loved Jessica’s belief in all things Santa and Christmas. She inspired the whole town. You should definitely watch the whole movie. The most famous of them all — Rudolph with his red nose!! Rudolph is my favourite, well without him Christmas just wouldn’t be the same.. Heck, there’s even a song about him!!Hahaha!! I’m another Rudolph fan. He’s the underdog so you have to love him. Hard to pick one. I like them all! Melissa, really enjoyed your interview. Thank you so much for the wonderful books that you write! Really enjoyed the interview ? Well of course I’ll say Rudolph. 🙂 Hme’s been my favorite from a little girl and that’s soooo long ago now. Looking forward to reading this. Thank you for the giveaway chance.